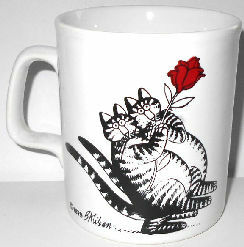 Here are two Kliban cats holding on to a red rose. The design is copyright 1979. The ironstone mug was made in England. It is 3 1/2" high x 3 1/8" across the top, not counting the handle. Dishwasher safe. Previously owned but in good condition.